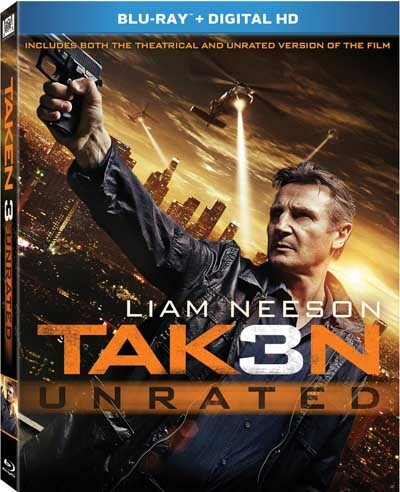 Liam Neeson’s back with his certain set of skills as Taken 3 arrives on Blu-ray in an unrated version and loaded with enough action to keep fans of the franchise happy. The film’s formula breaks some new ground as Neeson’s Bryan Mills is set-up for the murder of his ex-wife and one the run from the police. Directed by Olivier Megaton from a script by Luc Besson and Robert Mark Kamen, Taken 3 sees Neeson joined by Forest Whittaker, Famke Janssen, Maggie Grace, Dougray Scott, Sam Spruell and Leland Orser. Taken 3 brings the action to Los Angeles and sees Neeson on the run. The new film brings the action to Los Angeles as Mills continues to try to connect with his daughter Kim (Grace) and possibly rekindle his romance with ex-wife Lenore (Janssen) – who is having her own problems with current husband Stuart (Scott). Mills simply wants to live his life in peace and keep his family safe. He continues to not recognize that Kim is now an adult (and is later shocked to learn she is going to be a mother) and is conflicted by his role in Lenore’s life. Mills is a good guy – even agreeing to distance himself from Lenore after Stuart asks him to stay away while they work on their marriage. With the framework set, the film shifts into high-gear as Mills is framed for the murder of Lenore and is forced to hunt down those responsible with his standard method of investigation – kill everyone who is a bad guy until you get to the guy that ordered the murder. While on the trail of the killers, Mills is hunted by LAPD Inspector Frank Dotzler (Whittaker) and half of the LAPD. Since Mills doesn’t want to kill innocent police, most of the action sequences involve him taking them down in non-lethal ways – such as massive traffic accidents at high speed. The film unfolds at a predictable pace and makes sure to deliver the kind of big action sequences fans of the franchise expect. The writers try to throw a few twist into the formula, but they are pretty easy to spot coming and don’t help the franchise feel fresh. There is nothing wrong with the film, but it does have the feeling of if you have seen one Taken you have seen them all. At this point, there isn’t much Neeson and company can do to make the series feel fresh again – or to recapture the magic of the first film. For his part, Neeson continues to shine as Mills and makes the character deep enough to not be just another hero. Bryan Mills is a complex character. He is deadly and jaded, but wanting to be a part of his family and regain his love Lenore. When she dies, Mills uses his old contacts to not only keep Kim safe, but to track down all those responsible for him to take out. He kills with cold precision and doesn’t think twice about it. The film massively benefits from the talents of Whittaker. His Dotzler proves to be just as smart as Mills, and very up to the task of tracking him down. As the manhunt unfolds, Dotzler starts to piece the murder together and determine Mills may truly be innocent. Whittaker gives the characters a few quirks that help make him stand out, and it would be easy to see a film based on his character and taskforce. On Blu-ray, the film looks and sounds solid with the format making the most of the film’s action sequences. It also comes with some decent special features – including deleted scenes; a look at Sam’s Bunker (the rabbit hole Mills uses as a base); a feature on the Taken franchise; and a “behind the scenes” look at bringing the action to Los Angeles. Fans of Neeson’s brand of action or the Taken franchise will find plenty to love about this film. Taken 3 is a fast-paced movie that delivers the kind of large action-sequences the filmmakers know the audience wants to see. The formula might be starting to feel a little stale, but Neeson makes the movie worth watching.